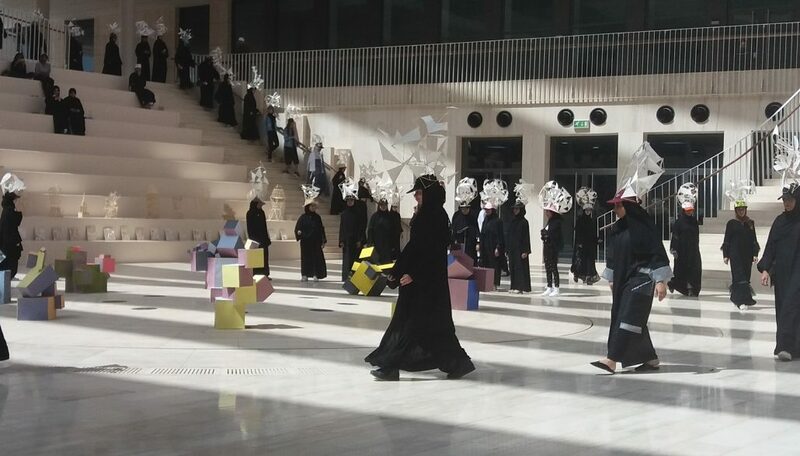 HALBAN GUtech students of the Department of Urban Planning and Architectural Design (UPAD) walked along the staircases of the university to showcase their ‘hat art works’ to other students and GUtech staff members. A special student exhibition entitled “Perceptions of Shapes and Spaces” was inaugurated today on campus. The exhibition showcases a large number of unique art works realized by more than 60 students within the past two weeks. “Perception is a key concept in design,” said Prof. Michael Schulze, Department of Design at RWTH Aachen University (Germany) who gave a lecture on the importance of arts and sculptural design within the education of architects. During his talk Prof. Schulze highlighted the importance of imagination, the ability to transform ideas and to develop a work concept along with the freedom to play with different materials like wood, glass, plaster, metal, stone, ceramic and others. “Human beings are only human when they play,” said Prof. Schulze while adding that the use of different materials in a creative way is very important for future work concepts, architectural designs and even technical projects. “While experiencing different materials, students are enabled to be create and to plan and design in future,” he said. In the student exhibition held in the large GUtech amphitheatre the students showcase different hat designs as well as other art works made of clay. “Each student had to find his own aesthetic expression,” explained Professor Michael Schulze who has been teaching a block course in the UPAD Department. “We worked for the first time with clay and plaster. For the hats we used tissues and bamboo sticks,” said Zahra Al Hasani, who works as a research assistant in the UPAD department. The exhibition of the various artistic works is temporary and on display in the GUtech amphitheatre. Prof. Michael Schulze during his talk at GUtech.